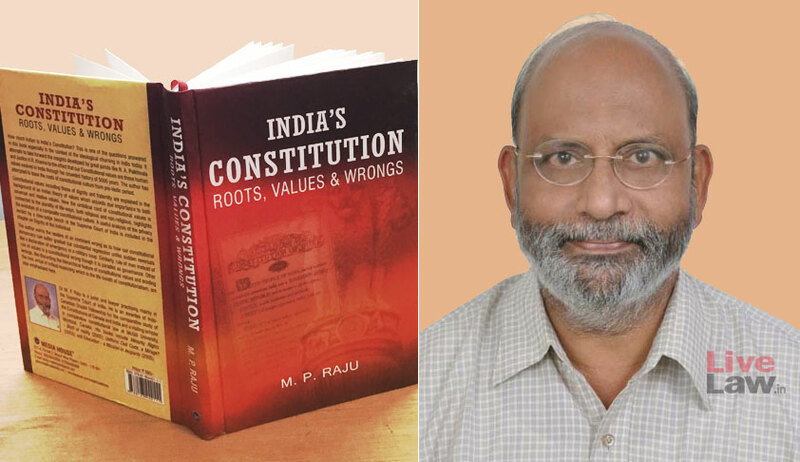 Supreme Court advocate, M.P.Raju's new book, India's Constitution: Roots, Values & Wrongs, [Media House, Delhi, 2017] starts with a simple question: "India has a Constitution. Does she have a constitutional culture?". Attempting to answer this in 464 pages of his book, Raju takes the readers to the social and moral dimensions of India's Constitution. Today, most of us take India's Constitution for granted. Raju reminds us, quoting Justice H.R.Khanna, that behind it, there is a story of sweat, blood and tears, of untold suffering and sacrifice. LIVELAW: You consider in your book, the dignity of the individual and fraternity as the most basic of our constitutional values. In relation to other values, why these appear as the most basic to you? M.P.RAJU: The book argues that the most important value we, through our founding mothers and fathers, have resolved to promote is fraternity. The preamble announces this in unequivocal terms. Our constitution has resolved to attain three objectives. All three are conveyed through three verbs: to constitute, to secure and to promote. Constituting is into a republic with certain characteristics which have their corresponding values beneath them. Securing to the citizens are a few entitlements and rights which also have a few values underlying them. Promoting among them all is only one thing which is the value of fraternity. Thus the single most value which the constitution seeks to promote is fraternity. Then the question would arise whether fraternity is the most fundamental value in the Constitution as declared by the preamble. A close look at the preamble would show that fraternity though fundamental is made subject to another value, dignity of the individual, and the unity and integrity of the nation. Thus it may be safe to understand that the dignity of the individual is made at least as fundamental if not more fundamental as fraternity. A happy marriage between these two fundamental values of individual dignity and fraternity begets freedom, equality and justice. An interplay of these would necessarily bring forth the values of sovereignty, both individual and collective, socialism, secularism, democracy and republicanism. Individual dignity and fraternity can be viewed as the two values invented and realized as necessary ingredients in the evolutionary process of mankind. The feelings and attitudes of individuality and fraternity are the two balancing energies which simultaneously develop and sustain the very evolutionary process. Sri Aurobindo in his Life Divine, has explained this complementarity of individuality and unity in the evolution of the world and humankind. In ancient India, there has been an evolutionary view on the development of human society including the institutions like family and state. In the Virat Sukta of Atharva Veda (AV 8.10.1-13) there is the description as to how from the individuals, the first fraternity develops as the family which gradually evolves into villages, clans, janapadas and to nation-states. The first stage prior to the evolution of family as a fraternity is that of the uncontrollable individuals (virat or viraj). This is described as terrorizing and fearsome. (AV 8.10. 1) It is the evolution from individuality to fraternity into a family and ultimately into a state and united nations which makes the individuals as those whom others need not be afraid of. The awareness about the autonomous and uncontrollable other can be fearsome in the absence of a relationship of fraternity. But with fraternity it can be soothing and mutually edifying, endearing and beneficial. In fact, at the core of the value and attitude of fraternity is an awareness of the dignity of oneself and that of the others. Thus individual autonomy is not a threat to fraternity but a boost and support for fraternity. Similarly fraternity need not be a threat to individual dignity and autonomy, but provide the necessary context and climate in which alone the dignity and autonomy of individuals can be enjoyed and even fortified. Without the dignity of the other my dignity is impossible to be gauged. Others' dignity is the test of my own dignity. Fraternity creates additional strength. When we two are together, there are in fact three. I, you and we. If we are not together or in unity, there are only two – I and you. We is something more than I and you. In the year 2016, the apex court had occasion to consider the interplay of the values of individual dignity and fraternity and reiterated its earlier view thus: "The concept of fraternity under the Constitution expects every citizen to respect the dignity of the other. Mutual respect is the fulcrum of fraternity that assures dignity" Subramanian Swamy v. Union of India, (2016) 7 SCC 221, para 161 at page 330,. LIVELAW: You end the introductory chapter with Hasan Manto's interesting short story on Ustad Mangu, who ran a Tonga, and who believed the Government of India Act 1935 was the new Constitution. After narrating the story, you observe that unless the constitutional culture and values percolate into all strata and areas of life both personal and collective, both private and public, the masses especially the poor and the needy would still be told every moment that it is the same old constitution. How, according to you, can this be achieved in a practical sense? M.P.RAJU: Dr Ambedkar had already alerted us that constitutional morality needed to be cultivated. The socio-economic revolution which the constitution seeks to bring about can not be materialized only through making laws, implementing them and adjudicating on them. The constitutional values need to be instilled and promoted in the private and public lives of the people. Actions and omissions of individuals and groups need to be interrogated on the touchstone of these values. It is not enough these values are dealt with as cultural or religious or political values. They need to be discussed and deliberated as constitutional values. People and their actions need to be evaluated and judged with reference to these values as constitutional values. The constitution itself prescribes the practical solution and remedy by way of fundamental duties in Part IV A: "(h) to develop the scientific temper, humanism, and the spirit of inquiry and reform." At the root of these are two-fold remedies: critical reasoning (scientific temper and the spirit of inquiry) and humanistic healing (humanism and the spirit of reform). What prevents the constitutional culture and values from getting percolated into personal and collective lives of the polity is the two-fold malaise - lack of critical reasoning and unconsciously embedded unhealthy or irrational tendencies. Since the most fundamental pillars on which our constitution is built is individual dignity and fraternity, the cure also would evince from them. In other words we need to assist ourselves and others to become more human. The core of human nature is in the faculty of critical reasoning. We need to encourage the exercise of causal reasoning. This was the oldest science in ancient India as in all civilisations. Kautalya asserts its importance as aanvikshiki in his Arthasastra. Constitutional values as in the case of all human values can be developed or adopted only through the exercise of critical reasoning. Similarly, the other reason for being inhuman or not fully human is the unhealthy and irrational tendencies, mostly unconscious, having their roots in early childhood experiences. From the President of India to the illiterate farm labourer or the differently abled destitute on the pavements all of us are victims of these demons entrenched in the unconscious. Difference may be in degrees only. These irrational or neurotic tendencies are diagnosable both at the individual, group and national levels. The cure again lies in the exercise of critical reasoning assisted by humanistic fraternity and reform both caring and non-harming. Such a continuous counselling, self or assisted as the case may be, both at the individual and collective levels can help the composite constitutional culture to evolve and develop illumined by the constitutional values. Constitutional culture and values cannot survive if we neglect critical reasoning. We can neglect it to our peril. It is the expression of the individual dignity. Fraternity can be acknowledged and realized only as a result of the exercise of critical reasoning. The less the habit or virtue of critical reasoning, the less our constitutional culture and the less the practice of constitutional values. LIVELAW: You have devoted 10 pages to a discussion of the recent landmark judgment on the right to privacy by nine Judges of the Supreme Court (pp. 330-40). You observe that the jury may be out on whether a nine-judge bench ruling, by itself, can instil the constitutional value of privacy in the minds, hearts and conduct of the unconvinced majority. You also quote from Keshavanand Bharati judgment of 1973 that "a social and economic revolution can gradually take place while preserving the freedom and dignity of every citizen". Are you optimistic of this being achieved, given the fact that it took almost 44 years for the Supreme Court, through a nine-Judge bench, to reaffirm what was held in 1973? M.P.RAJU: There is a fearsome scenario despite the unanimous verdict declaring privacy as a fundamental human right. This ruling by the apex court declaring the fundamental right to privacy as an inalienable and inherent right makes it legally enforceable but subject to reasonable deprivations through a procedure established by law. But as a constitutional value does it hold any strength today? The very fact that a nine-judge bench had to be constituted points to the faultlines deeply entrenched in the Indian polity. The frontal attack on the sacred privacy of the little Indians through the Aadhaar (unique identity) card requiring biometric data including the iris of each Indian was launched during the previous UPA government. Of course, their supporters may argue that they intended to make it voluntary but with a few necessary baits for the poor masses. The subsequent NDA government not only brought in a law through the backdoor of a money-bill but also made it compulsory for many welfare schemes initially and for almost every public and private transaction eventually. The height of the scary prospect was seen when great jurists and senior lawyers including the Attorney General of India representing the central government and BJP governments in the states and their supporting NGOs argued against such a fundamental right and tried to dissuade the court from ruling in favour of a fundamental right to privacy. Thus it shows that the representatives and the so called intelligentsia from the majority of the political spectrum do not seem to digest privacy as one of the fundamental values of the Constitution. The former Attorney General, Mukul Rohatgi, and the present one K. K.Venugopal tried to persuade the court not to accept privacy as a fundamental constitutional right. That means they themselves and those whom they represented did not believe in the value of the privacy of the individual as a constitutional value. Similarly, some other great jurist lawyers and their client governments too argued objecting to privacy as a fundamental right. Let us be reminded that this was not merely any adversarial adjudication of a legal dispute, but an exposition of how we understood our Constitution. It is difficult to explain away that the great jurists were putting forth the stand of their respective clients, despite their understanding and belief about the constitution to the contrary. So privacy as a constitutional value is in great jeopardy. The major chunk of the polity from both sides of the political spectrum did not believe in it as one of the basic constitutional values worthy of protection and promotion. Can a nine-bench ruling by the Supreme Court alone instil the constitutional value of privacy in the minds, hearts and conduct of the unconvinced majority? Judicial diktats alone may not be able to defend and protect the evolution of a constitutional culture against such a popularly supported ambush, though absurd and misguided. LIVELAW: Hope as a constitutional value might have been relevant in 1947. But to continue to have faith in this value may mean encouragement to status quo, and resistance to experiment change. Your comments. M.P.RAJU: Our constitution like any other constitution is built on the value of hope. Every constitution contains two types of elements: functional and aspirational. Aspirational elements can be called the "constitutional ideals". The fundamental duties in our constitution speak of the ideals of the constitution. These ideals rest on the value, virtue and attitude of hope. It is hope which inspires us to challenge the status quo and to experiment change. is the same value which is reflected through the substrata of various values expressed through the proverbs and anecdotes in different languages and dialects. Same value also finds its expression in the literature through the epics, literature both religious and non-religious and also the folklores . The preponderance of the value of hope has made outsiders to comment that the Indian literature lacks tragedy. It is also commented that Indian ethos wants its drama and stories to end up on a positive ending unlike the Greek tragedies. It is the same value of hope which finds its expression in the ideals of Ramarajya, Sambhavami Yuge Yuge, Vasudhaiva Kutumbakam, Loka Samastha Sukhino Bhavanthu, etc. Hope, as a value, is one of the basic foundations of our Constitution. This is evident not only from the different provisions of the Constitution which positively look forward to a better society but also from the assertive declarations that socio-economic revolution has already arrived. In the context of the Constitution, 'hope' as a value is born from the tension between the present and the future. The ideal polity or society which the Constitution declares has already arrived but at the same time has not yet fully come. That is the precise reason why it provides for a number of restrictions on the State, duties of the citizens and the policy directives for the State. Thus in the midst of the tension between the already and the not yet it is hope as a value which not only sustains but also provides for a reason to exist as far as the Constitution is concerned. India does not need a Pandora's Box; nor does it believe in such a hopeless situation when all the troubles have been let loose, but hope alone is kept unreleased. In the contemporary thinking, philosophers and psychologists have given a lot of importance to the value of hope. An example would be the case of positive psychology which emphasizes on the strength of the people rather than their weaknesses. In the philosophy of human rights, hope is given the place of the foremost value calling it the value of positive thinking. Even in the field of international relationships it is now acknowledged and recognized that a campaign for peace has to necessarily base itself on the value of a positive outlook. Indian Constitution has acknowledged the importance of this positive outlook even in the international relationships when in Article 51 it placed a bounden duty on the State to promote international peace and security. This was to be achieved not by any annihilation of rogue states or by propagation of our way of democracy or our becoming a big brother or guru to others. This is the reason why Article 51 specifically directs the State to maintain just and honourable relations between nations and to foster respect for international law and treaty-obligations and to encourage settlement of international dispute by arbitration. Thus 'hope', as a value, gave India the courage to hope against hope even at a time when India was struggling to get out of the yoke of colonial rule and at the same time finding itself entangled in poverty, untouchability and all kinds of socio-economic problems. Today, it is important to keep this value of hope alive and allow it to be permeated through the individual and collective lives of people. Otherwise, it is very natural that we may find the Pandora's Box full without the hope being released. Today, many of the difficult problems faced by India are attributable to a great extent to the absence of hope as a value both in the lives of the individuals and of the groups. Different forms of terrorism can easily be found as arising out of or facilitated by the absence of hope. Even the lethargy, passivity and hopelessness which are found reflected in the daily lives, especially of the youth call for an urgent emphasis on this value of hope as our Constitution has advocated. It is also important to nourish the core values which are the ingredients or the supportive values which sustain the value of hope, such as positive outlook, selfesteem, affirmation, etc. It is also necessary to revisit the value of hope as expressed in our composite culture. Hope is required, since fear of failure is there. If success is sure there is no need of the value of hope. Hope is necessary since the human situation is such that there are uncertainties. It is the only antidote for superstition, and fatalism. Fatalism and hope lie very closely but are essentially different. People can easily confuse between them if the virtue of critical reasoning is absent. Experts are now agreeing that hopeful thinking is a value-based attitude and it does not appear to be based on genetic inheritance, but reflected on learning experience. The necessity to inculcate the value of hope and cherish and train ourselves into that is partly because of the human situation which has not only a lot of difficulties to face but also innumerable uncertainties. With all the scientific advances and the techniques of predicting and foreseeing the results, the human being at every step realizes that everything is not in his control and at the end of the day there remain still uncertainties. Even the most successful and ablest person is faced by the fear of failure. In the uncertainties and fear of failure is the fertile ground for superstition to grow. It is also a field for gambling, oppression and despair. It is the hope as a value which alone can operate as an antidote to these difficult situations. In fact, it is the lack of the value of hope which makes people to resort to terrorist activities. It is the same hopelessness which makes individuals and groups to take law into their hands. Thus in the absence of hope as a constitutional value, the very constitutional culture would deteriorate and the polity and the nation may disintegrate. Without hope even the private lives of individuals and groups would become meaningless and gloomy, making the constitutional promise an irrelevant rhetoric and a cruel joke.